It is a remarkable coincidence that I and another local history enthusiast share an interest in the identical shop at 101 Gloucester Road, Brighton. In this text we have combined our resources and used a few old family photographs taken during the 1930s, to show its transformation from a master butcher’s into a second hand furniture shop. The history of 101 Gloucester Road, Brighton however, starts sometime between 1849 & 1850 when it first appeared in the Brighton street directory and George Newman, a local boot maker, took occupancy. The Newman family remained at the shop until the 20th century, by which time that family had begun to focus more on the sale of leather goods. The proprietors of the shop occasionally changed after that, but up until 1924, the retailing of leather products was still each shopkeeper’s main source of income. It would then appear that as 101 Gloucester Road had 3 doors to the street, parts of it were sublet and re-numbered, but we have yet to decide whether it was subdivided into two or three, and the numbering used. Was it 101 + 101A + 101B, or, 101A + 101B + 101C? Street directories post 1924 state that 101 was a draper’s shop, 101A a boot maker’s, and 101B a tobacconist’s. 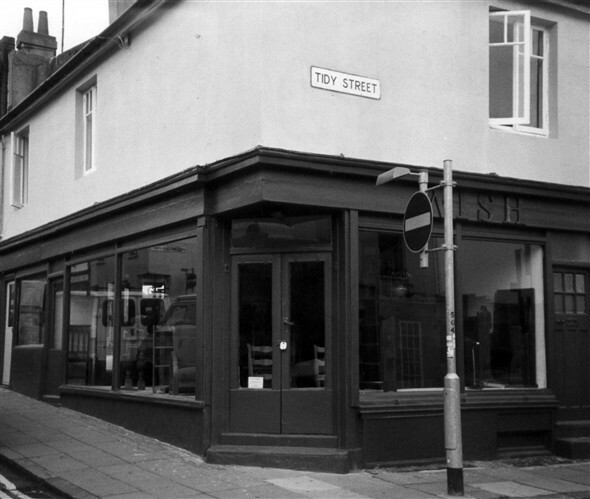 The tobacconist’s then became 101, with the boot seller still at 101A. The shop’s major change of use was around 1928 when Charles Frederick Davis converted 101C into a butcher’s shop. 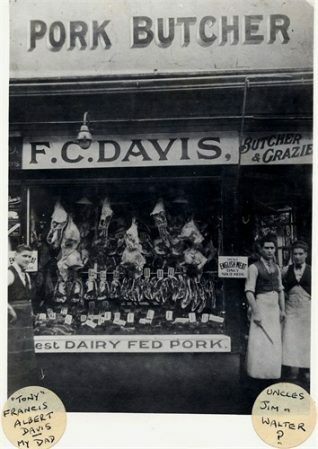 By 1930, his son Walter had taken this over and W S Davis (butcher) was shown in the street directory as trading from 101A and 101C and later editions confirmed the Davis family remained at that address until 1932, before moving to a shop in Portslade and opening a new business just across the road at 25 Gloucester Road. 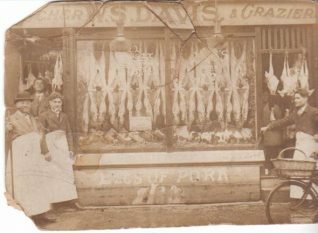 In 1933, ownership or the lease of the shop (now listed as trading from 101 & 101B) shifted to Cyril R. Kitchingham (another butcher) and that family remained there until 1937. 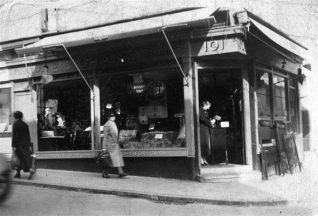 The lease was then taken on by Ernest Christopher Grant, a second-hand furniture dealer, who was in business until about 1940, before becoming one of Brighton’s wartime firemen. In all probability, the third subdivision, sometimes known as 101A or 101B, was just a single room with its own access, which was occasionally sublet to small concerns. From 1930 – 1940 it served as a drug store run by E.J. Millar, Winifred’s Ladies’ Hairdresser, and eventually became another ladies’ hairdresser run by a Helene Johnstone. Because of the War, there were no further street directories published until 1947. 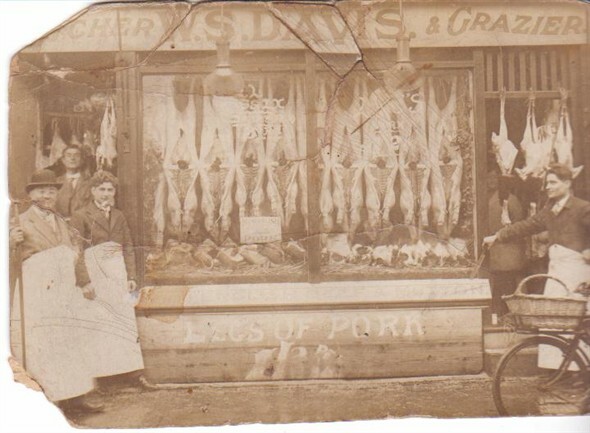 Thanks to Andy Grant, who gleaned much of the information about previous shopkeepers from early Brighton street directories, and Sara Brooks for agreeing to let us publish her photographs of the Davis family butcher’s shops (taken c1929 & c1932). My Great Uncle George Offen had a shoe repair shop at 94a and a hardware shop at 95, Gloucester Road (Kelly’s Directory Of Sussex 1905, part 2, Page 116). These numbers are on the corner of Trafalgar Lane and Gloucester Road. He died in 1916 while living at 95, Gloucester Road. My great great grandmother Kezia Miller had a boarding house at number 20 Gloucester Road in 1898. No, I was wrong, it wasn’t Gloucester Road, it was 20 Gloucester Street. Didn’t know there was a difference. Great website. I’m trying to trace family members of the Davis butchers. My grandfather was Walter Stanley Davis. Any relations of his brothers or sisters? I would like to keep in touch.